Also pick up the seasonal rare Ornate Blade in celebration of Minar's Birthday! Upgrade your account with a one-time only payment and unlock exclusive areas, weapons, mecha models and more! Nova Gem Package: 15,000 Nova Gems - plus the all-new Prototype Accelerator Containment Vessel Mecha for every Star Captain on your MechQuest account! Scales with you to Level 100! Get yours today! For this deal and more, check out our secure upgrade pages or visit the portal site. Starships Have A New Room! Go East (right) in your Captain's Quarters to access the new room. An ancient order of galactic guardians has been reborn! Back in the days when Dragons roamed the galaxy, an elite group of mecha warriors fought at their sides! The Dragonguard were some of the most fearsome warriors in the history of MechQuest and they have returned to fight for honor and glory! The Dragonguards earned their mechas one piece at a time through their loyal dedication to the order. Now, you too will be able to build your own Dragonguard mecha one piece at a time! For every 6 months that you have been an upgraded Star Captain, a new piece will become available to you! You will also receive 10,000 Nova Gems and a new Dragonguard Rank for your Character pages! Each Dragonguard Upgrade will cost $19.95! To see if you are eligible for one of our Dragonguard bonuses, check our upgrade pages. 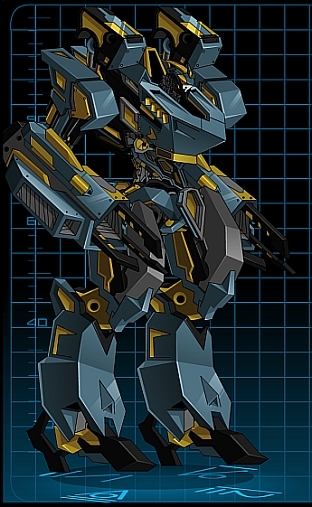 Get your FREE Golden Mecha Models in the Event Shop at Tek's Mechs! You can also use the News button at the bottom of your screen to access this shop. X-Boost Upgrades are special NovaBoost items that give you 10% extra Credits and Experience for every battle! 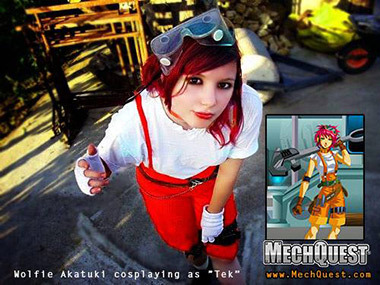 Get your's NOW at Tek's Mechs in Soluna City! Light's Blades in Soluna City East has an all-new shipment for Black-Belt students! Saw this posted on a cosplay contest and just had to share. If you see any more, post them on the MechQuest facebook. Give us a like while you are there. You can now increase your inventory, mecha, and starship slots even more. More space for your souvenirs and customization! The number of buyable slots has been doubled. If you have Personas for Firefox, you can deck out your browser with our awesome new MechQuest Firefox Skin! Get it Here! Visit Circe in Soluna West at the Art Museum! 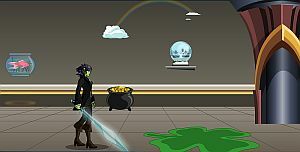 Click the link she gives you to get to the MechQuest Art Museum submissions forum to participate! YOUR artwork could be selected to be put on display for a month! Note: If you have upgraded your account in either DragonFable (DragonLord) or AdventureQuest (Guardian) you can verify it using the menu to the left. This will allow you to access the special shop on the GEARS University Shuttle in addition to upcoming perks for supporting our other games. Thank you!